As part of the lecture “Geodatenerfassung”, geography students in their first semester turned theory of digital geodata acquisition into practice. Based on their aims and requirements, the students acquired geodata with different methods and sensors. 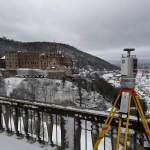 Using a high-end Riegl VZ-2000i terrestrial laser scanner, two groups captured the old town of Heidelberg and a limestone quarry as 3D point clouds and thereby learnt how to define a proper scan setup according to their geographical application. Other groups used their smart phones for noise mapping, the creation of photogrammetric models of a church or the evaluation of the quality of cycle paths in Heidelberg. Geodata acquisition with a Riegl VZ-2000i terrestrial laser scanner. Heidelberg castle is in the background. Resulting 3D point cloud of the old town in Heidelberg (coloured by range). The objective of this practical exercise is to get in touch with latest methods, sensors and concepts for the acquisition of digital geodata, since this is an essential part of geographic work in science and practice. For individual geodata acquisition methods (e.g. 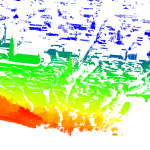 user-generated geodata on the web or 3D laser scanning), the GIScience and 3DGeo research groups regularly offer special courses for further in-depth training. You might be interested in reading about latest teaching activities in Morocco or Austria in our GIScience News Blog.